Justina Nixon-Saintil is the Director of Education and Technology programs for the Verizon Foundation, an organization within the Verizon Corporation that focuses on addressing issues in education, healthcare, and energy management in communities in need. Nixon-Saintil leads the foundation’s education initiatives for K-12 and higher education with an emphasis on implementing technology-based solutions to improve STEM-related academic achievement in underserved communities. Prior to joining the Verizon Foundation, Nixon-Saintil held several leadership positions within Verizon; most notably as a member of the company’s Broadband Product Development team, helping to launch the company’s high speed internet product. Before joining Verizon (then NYNEX) in 1996, Justina worked as an Engineer for the U.S. Department of Energy in West Valley, N.Y. She has authored several articles on the intersection of parenting skills and general leadership skills, and has served as a marketing consultant. She is a member of the national service organization, Jack and Jill of America, and is very active in the parent-teacher organizations at her children’s schools. Nixon-Saintil recently spoke with WashingtonExec and talked about why STEM education is critical to America’s youth and future, she revealed what’s unique about the Verizon Foundation’s Verizon Innovative Learning Schools Program (VILS), introduces us to Thinkfinity.org, tells us the biggest misconception about STEM and explains how parents can encourage their kids to get involved in STEM. WashingtonExec: Why is Verizon interested in engaging youths; helping them to be interested in STEM subjects? Justina Nixon-Saintil: We believe that our long-term growth and success is tied to addressing some of society’s biggest issues and one of them is getting the youths of America interested in STEM fields. According to STEMconnector’s recently released EdTech: Revolution in Education report, 80 percent of the fastest growing jobs in the U.S. requires STEM-related skills. Yet, the country is not graduating enough students with these skills to meet this growing need. To date, as many as 3 million STEM jobs have gone unfilled. We have two unique programs, and in each case we target youths because studies have shown that their interest in STEM starts to decline in middle school. The Verizon Innovative Learning Schools program and the Verizon Innovative App Challenge aim to reverse this trend by taking advantage of this critical window of opportunity to capture and keep their interest in STEM subject matter. By leveraging mobile technology, which studies have shown leads to increased engagement, we aim to positively impact middle school students’ achievement. We commissioned a survey, conducted by TRU, on middle school students’ use of mobile technology. It showed that more than one in three middle school students used smartphones and tablets for homework. But, only six percent of these students used smartphones (18 percent used tablets) in the classroom for learning. Interestingly, the study also revealed that the students who used mobile devices in the classroom were more interested in STEM. For our country to close the gap between the number of students graduating with STEM skills and the number of STEM jobs available, we have an obligation to meet kids where they are with technology and use it as a way engage to them in STEM now so they become our future drivers of innovation. WashingtonExec: What is unique about the Verizon Innovative Learning Schools program? Justina Nixon-Saintil: A main reason for the disparity between how students are using technology at home and in school is that teachers are anxious and unfamiliar with how to use mobile devices as a learning tool. That is why we launched the Verizon Innovative Learning Schools (VILS) with our partner, the International Society of Technology in Education (ISTE). VILS is a national, two-year teacher training and mentorship program designed to increase the use of technology for learning, drive student interest in STEM and improve student performance in these subjects. Administrators and teachers in underserved schools across the country receive a comprehensive and ongoing sequence of onsite and online professional development on how to effectively and innovatively integrate existing mobile technologies into classroom learning. VILS also builds leadership through one educator at each school who serves as a technology coach. He or she assists colleagues throughout the year as they leverage technologies for instruction and keep up to date on the newest digital tools. A recent evaluation of the VILS program shows positive impacts in the classroom: 37 percent of students improved their learning in STEM subjects, 38 percent of students showed increased engagement in class, and 52 percent of students demonstrated increased proficiency with mobile technologies. Based on these promising results, we expanded the program into 12 more schools this year, a total of 24 schools around the country. WashingtonExec: Is there a way for educators outside of this program to get some of this training? Justina Nixon-Saintil: All teachers can benefit from the VILS training. Any teacher interested in implementing a similar program in their school can access content generated from VILS on our free online platform Thinkfinity.org. Within Thinkfinity, teachers can connect with VILS teachers through the Spotlight series, learn about best practices and take part in webinars aimed at supporting mobile learning. 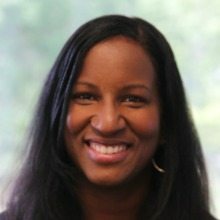 Justina Nixon-Saintil: Thinkfinity.org is a free, online and interactive platform for K-12 educators. In partnership with leading national, education organizations, such as the Smithsonian’s National Museum of American History, National Geographic Society and the National Council of Teachers of Mathematics, the site offers standards-aligned, classroom-ready content including K-12 lesson plans, media-rich interactive videos, mobile apps, webinars, and more. We have a growing network of more than 70,000 educators who share best practices, troubleshoot potential issues, network and start new discussions, all in real time. WashingtonExec: What is your background and how did you get involved in STEM? Justina Nixon-Saintil: Growing up, I was always interested in how things worked and excelled in math and therefore pursued an engineering field in college. I received my Bachelor’s degree in mechanical engineering from the University of Buffalo and worked as an engineer for the U.S. Department of Energy in New York before joining Verizon, then NYNEX. I have always been interested in education and giving back to the community, so I jumped at the opportunity to become Verizon Foundation’s director of education initiatives. I am able to combine and apply my love for math and teaching and implement programs that encourage and motivate students to do well in STEM subjects and eventually pursue these fields into and beyond college. WashingtonExec: Please describe your day to day responsibilities. Justina Nixon-Saintil: On a typical day, my schedule may include visiting one of the schools in our programs, meeting with potential partners to discuss strategy, reviewing program results with current partners, providing support to my team, and ideating on new and innovative programs that can support our education strategy. I also continue to look for new technologies that can be piloted in classrooms to better engage students and get them interested in STEM fields. My work is always busy but also extremely fulfilling. WashingtonExec: What else is Verizon doing to get students interested in STEM subjects? Justina Nixon-Saintil: Last year, we launched a nation-wide student-driven program called the Verizon Innovative App Challenge, where we asked middle and high school students in the U.S. to submit ideas for a mobile app that addressed an issue in their school or community. The response was overwhelming. Students from every state and Washington, D.C. registered, and more than 470 app concepts were submitted. All the concepts were unique and creative ideas that ranged from encouraging a community to recycle, to making it easier for students with disabilities to take notes in class, to identifying invasive plant species in lakes. Because of this App challenge, students shared that they learned how to collaborate and work together in a group. One female student who helped design the concept for the Chow Checker app said that the App Challenge allowed her to create something with technology even though she was not computer savvy. It is clear that technology can get kids excited about learning, and it was delightful to see the care and thoughtfulness these students put into developing a solution to a real-world problem. The second annual Verizon Innovative App Challenge will open on Sept. 3, 2013, so educators and parents who want to learn more and students who want to register can visit www.verizonfoundation.org/appchallenge. We’ll have eight “Best in Nation” winners who will receive the latest Samsung Galaxy Note 10.1, courtesy of Samsung Mobile, a $20,000 grant from the Verizon Foundation for their school to advance STEM programs and training to build their app with app development experts from the Massachusetts Institute of Technology (MIT) Media Lab to make it available on the Google Play store. WashingtonExec: The U.S. is not turning out the engineering students that we need to in order to compete as an innovative country. Why is this issue so important? Justina Nixon-Saintil: Our country needs more than just students with engineering degrees. As noted previously, more and more jobs require STEM knowledge. Our country is not graduating enough students with STEM skills and STEM fields aren’t usually portrayed as the creative fields that they can be. The fact that our nation lags behind in these fields gravely affects how we compete as a global leader. It is important that we produce creative minds that will generate unprecedented ideas and invent groundbreaking technologies that will solve societal problems and help people around the world. Not only will this propel us to the forefront of innovation, but it will spur our country’s economic growth. WashingtonExec: What’s your view to get more parents involved in STEM? Justina Nixon-Saintil: Parents can do a lot to engage their child/and or children from asking them to consider the science behind today’s technologies, to asking questions and finding out how things work to job-shadowing. Parents can also help engage their kids in STEM subjects at home by letting them use their smartphones and tablets to learn and complete their homework. I see my own three kids use mobile devices and the Internet every day for leisure and these devices can be excellent education tools if used right. There are many free online games that help students better understand subjects that may be challenging to them. Parents should also encourage their children, both boys and girls, to excel in science and math and find opportunities such as app development programs and robotics and engineering clubs that could provide them with opportunities to actually create a product or solution. As parents, it’s our job to encourage, excite, monitor and guide our kids so they can expand their mind and figure out what they like and want to do when they grow up. WashingtonExec: What’s the best STEM success case study/project that you have been personally involved in? Justina Nixon-Saintil: This past March, I had the opportunity to surprise a team of sixth graders from the Bronx Academy of Promise who emerged as one of the Verizon Innovative App Challenge winners. It was an incredible experience to witness firsthand their reaction to the announcement – from being stunned and speechless to extreme excitement and cheers the whole school could hear. King, Sherly, Michael, Rokia, Jhony and Samuel, who are only 11 and 12 years old, accomplished something they never thought possible. But it goes beyond just winning a national contest. I grew up in the Bronx, not far from this school and near the projects. I learned how truly meaningful this opportunity was for them. They thought they would never win a mobile app competition because only one student on the team had a smart phone. With assurance from their teachers that the use of technology to design the app was optional, the students used what was available – pens, colored pencils, paper and their imaginations – and started to work. They combined their love for math, Greek mythology and video games to create Quest Math app, a Greek mythology-themed education game that helps students improve their math skills. As a part of their prize, now they all have a Samsung tablet; they worked exclusively with MIT’s elite app development experts, they flew to Orlando (many had never been outside New York City) to present their app to more than 5,000 people at the Technology Student Association national conference and soon they will see their app Quest Math on the Google Play Store. The App Challenge introduced them to a whole new world in STEM, and it showed them the possibilities within their reach through mobile technology. When we asked Sherly how she felt about the competition, she said that now her future has been decided for her and she wants to become an app developer. Sherly and her team are an excellent example of how incentive, encouragement and technology can level the playing field and empower kids even from a very underserved area in the Bronx to be our next generation of innovators. WashingtonExec: What’s the biggest misconception about STEM? Justina Nixon-Saintil: A big misconception about STEM is that science and math are only for boys. Boys and girls are equally capable of learning STEM subjects; they just need to be encouraged and supported. I was delighted to learn that more than half of the Verizon Innovative App Challenge winning team members were girls, and one of the 10 winning teams was comprised of all girls! After getting a chance to speak with many of them, I found out that their favorite subjects include math and computer science. They also aspire to make STEM a career – interested in going into fields such as radiology to biomedical engineering and yes, to even app development. When opportunities like the App Challenge are available to girls, it not only fuels their interest in these subjects, but it also gives them the confidence to pursue STEM along with their male peers. WashingtonExec: Who do you admire in terms of STEM education? Justina Nixon-Saintil: As an engineer, I have a particular affinity for this field of work and I appreciate the effort and dedication that goes into pursuing a STEM career. I may also be biased, but I admire engineers because they actually create solutions that solve problems in society. They also have an understanding of how systems and processes work in every aspect of our daily lives. I find the field to be incredibly fascinating. WashingtonExec: What’s the future of STEM? How can other like-minded people get involved? Justina Nixon-Saintil: According to the U.S. Department of Commerce, STEM jobs are expected to grow by 17 percent by 2018 versus nine point eight percent growth for non-STEM jobs. These are the careers of the future. Our country’s demand for people with the knowledge and skill sets in STEM will only continue to grow. So whether you are a teacher, a parent, a government official or a business leader, we need to teach kids the importance of gaining STEM skills and do our part to motivate and inspire kids – whether it is through mobile technology or a science camp – to pursue studies and careers in these fields. They are the leaders of tomorrow and it is imperative that we help prepare them for success in the 21st century. Visit For more information on thinkfinity, click here. Next Article WINE & DINE COLUMN: How Do You Measure Wine Value?